According to the “Which Enemy of the Christian Faith Are You?” quiz I’m an atheist. Hardly surprising really. Go ahead, do the quick quiz, it’s only ten questions, find out which enemy of the Christian faith you are. Once you’ve got your results click on the ‘See all enemies?’ link and have a look at all the possible enemies, some are quite funny, I like the Catholic Priest one. One other thing for today, Zeno left a comment in my about page today with a link to his site selling anti-religious t-shirts. Normally I think it’s bad etiquette for a first post to be plugging your own blog, especially if you are trying to flog something. But I’ve given Zeno the benefit of the doubt this time as some of his t-shirts are quite funny, in an obscene way. Anyway, here’s the link to his blog, which has links to his apparel. Don’t think I’ll be this nice and generous next time. Hat Tip to Adrian at The Atheist Blogger for the link to the quiz. I will take the quiz but first I wanted to leave you my email address but I ask that you delete it after you write it down in case you want to share. I responded to your comment in my comment section. I took the quiz and I’m a Nothing. Couldn’t-Care-Less…..
I’m kind of surprized although, I don’t know why…. Kind of miffed they didn’t have Satan’s Luetenanat as an option. Hmm. Very amusing, but it got me wrong. “You are one of Christianities (sic) worst enemies.” No I’m not. I don’t believe in it but I prefer it to atheism. I believe very strongly in the UN Decl. of Human Rights, (60 on Wednesday, happy berfday), which lays down freedom of religion ,art.18, I’m one of the few people who’ve actually read it. I was an atheist too. I wanted to be the perverted old priest though… maybe when I’m older. 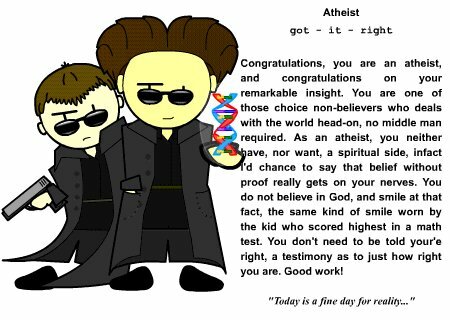 I got atheist…DUN DUN DUN.